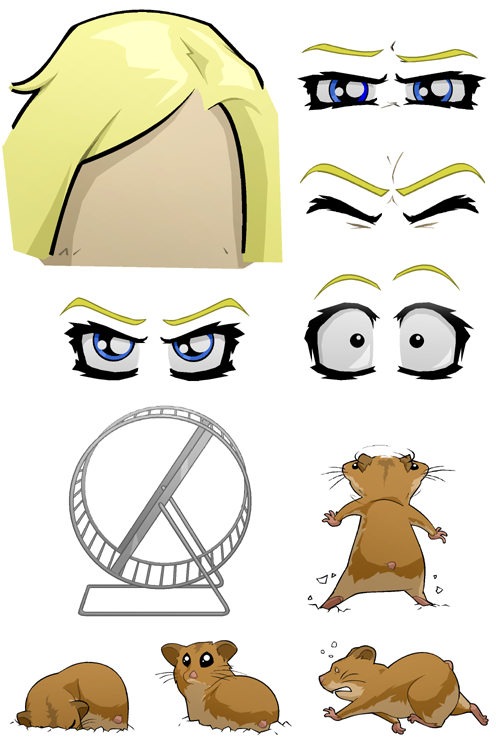 I’d been asked by a few about the layout of the repeating elements in the hamster panels, so I’m pasting the different elements I did for them. Once the base for Ellie’s head was done, and there’s colored background behind it, I just added a layer > oval selection > fill white > Gaussian blur for the mid-fade to white. Then I placed the wheel (making sure the hamster-standing and hamster-running would both adequately fit below and above. Merged these repeating elements, then duplicated for the four panels. Move the eyes and hamsters accordingly. So while watching it the other night, I looked it up on Wikipedia, and found something that disturbed the hell out of me. I’m not sure why I find this as funny as I do but man, it’s hilarious. 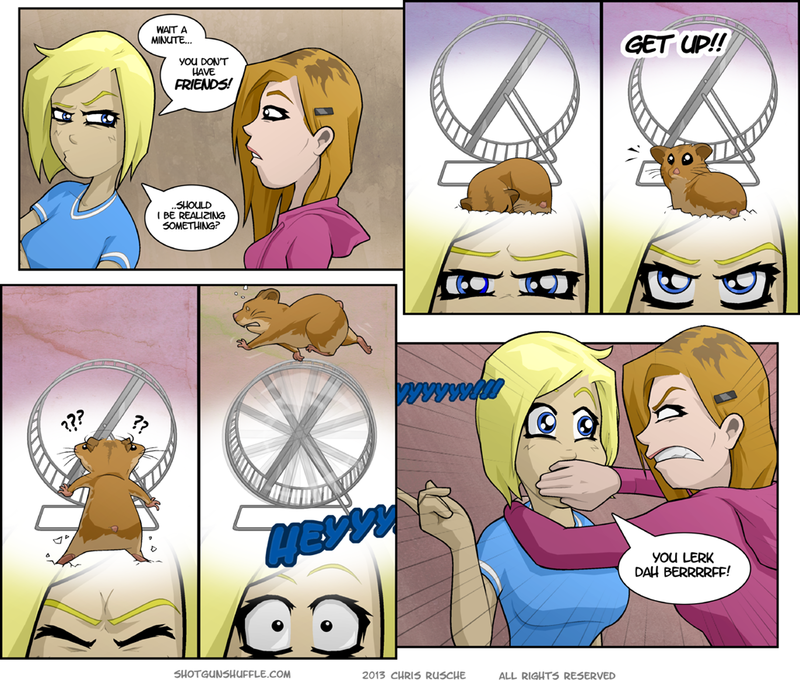 From “should I be realizing something” to the hamster frantically running on the wheel (the wrong way) the use of Ellie’s eyes/expression combined with the hamster is comedy gold. Ellie is a credit to dim but oddly perceptive people everywhere. And once again Quinn is making an angry face. If there was a shotgun shuffle drinking game Quinns angry face be a shot. Also, I was looking back over some of the early strips again to compare and contrast your art as it has developed and I have to ask, did you ever read the comic Boondoggle? It was an indie (print) comic I used to read back in the mid/late 90s time frame and your early strips remind me of it to some extent. No, I never read the comic. Can’t seem to find much about it on the internet, so I’m no able to see his art progression. What’s really disturbing is that you’re looking at pictures of the Brady BOYS when you could have been looking at Marsha. I used to crush on Marcia when I was little, sure. But in my defense, this was a picture on the show’s page, put there to obviously shock and horrify me! I’m pretty sure Bobby looks the way fifty year olds are supposed to look. The others have faces that have been injection molded by expensive surgeons. 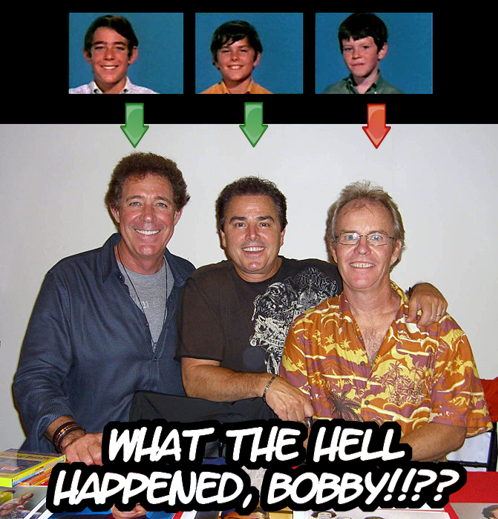 But yeah, take age out of the equation and Bobby looks like a Breaking Bad extra. I would have to suggest that there is an inverse mathematical relationship to tv age and Dorian Gray. Where as Dorian Gray could not look at his portrait, Bobby Brady is not such, and his actor may look upon him. However, the aging factor is then proportional raised to the 1.125 power and increased against the norm. It could also be the effect of the shirt that he chose to wear. I also scoured his wikipage for any alleged drug use. I mean, there should certainly be some on there! Personally, I always thought Greg looked like a douche. I think he is. Word is he tried to bone Florence Henderson when he came of age. And it says on Bobby’s wiki page that he’s a huge deadhead (which implies drug use…lots and lots of drug use). Pretty much what I thought as well. I wonder how he is going to react to that comment. … Not the obvious one, where she likes him…. the one where Ellie says that Quinn doesn’t have any friends. I’m starting to think the only reason that Quinn is dating Alex only because Alex is the only guy that actually paided attention and complemented her. Quinn may infact tell herself that’s the reason, but Ellie points out exactly why she dates Alex, which I’ll cover in the future. Of course the combined light from levels 2 – 4 will be back lighting her eyes and the first level in her pupil, with the fifth level adding effects from back lighting of Quinn’s hair. The only other question that could be asked at this time, would be: Are girls able to talk to each other in tones that indifferent males will not be attuned to, no matter how loud they may whisper??…. Where is Eddie Nigma when you don’t need him? Three exponential sizes, did grow her frown. hee hee hee hee, I was wondering which one would have gotten that type of response. Besides the Copyright statement. This thread has been started in parody for the enjoyment and entertainment of the members of this thread, and is available for public use with no cost whatsoever. The characters are owned by their respective copyright owners and creators, unless the creators have been bought out and dumped to the curb. In that case, Quinn may have a room empty by the end of this date. Yes, snap her neck. Prove that you are a supervillain. Eliminate those that know your secrets. Ellie’s half-assed hamster can only half-assed get it done and Ellie can still get it right. I’m scared of what she can do if she actually applies herself.